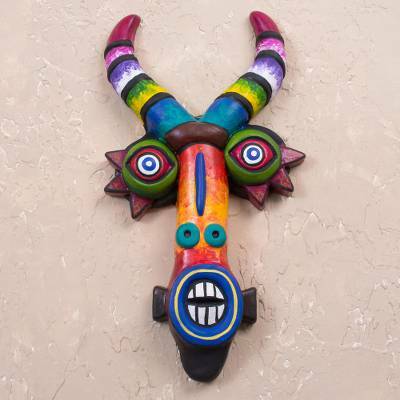 Colorful Ceramic Devil Mask Handcrafted in Peru, "Colorful Devil"
Inspired by pre-Hispanic depictions of devils, Peruvian artisan Salomon Ruiz Goin creates this striking wall mask to add a pop of color to your home decor. The devil is handcrafted of ceramic with curved horns and painted with vibrant, multicolored designs in the style of masks worn during la diablada puneña dances. Salomon Ruiz Goin has received 8 microcredit loans with 0% interest from Kiva and Novica, the first for $200 and the most recent for $200. Proceeds were used to purchase raw materials for the Andean masks he creates.